One of the Armenian Bar Association’s primary objectives is to facilitate access to justice and to provide related education opportunities by volunteering pro bono legal services to the Armenian-American community and to the broader non-Armenian populace. Just in the past several months, ArmenBar attorneys and law students from the National Armenian Law Students Association have teamed up to offer a series of far-reaching programs. 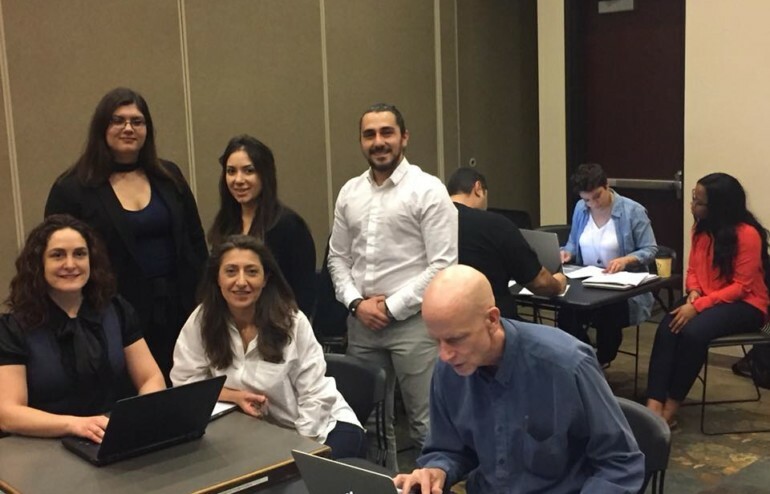 In October, 2017, the Armenian Bar partnered with the Loyola Armenian Law Students Association, under the leadership of National ALSA President, Sarkis Yeretsian, to hold a pro bono legal clinic at the Hollywood Armenian Center where several participants were assisted with their legal questions. More than a dozen lawyers and law students devoted several hours to the program. Then, later in 2017, when the Armenian Bar learned that vulnerable senior citizens were the target of a fraudulent scheme in which teenagers posing as Armenian school students wrangled donations for a phony library improvement, the Armenian Bar promptly took action to help bring these deceitful acts to an end. With the support and leadership of Onnig Bulanikian, Director of the City of Glendale’s Community Services and Parks Department, the Armenian Bar joined the Department’s Senior Services Division to present “Know Your Rights” lectures, thereby putting our elderly in a better position to protect themselves from such deplorable ruses. “The elderly members in our community are an especially vulnerable segment of the population who, unfortunately, sometimes find themselves to be the victims of abuse and financial scams designed to take advantage of them,” said Saro Kerkonian, Chairman of the Board of the Armenian Bar Association. “Working with Glendale city officials, we identified the areas of greatest need and developed a program to educate the elderly and their caretakers to heighten awareness of the issues and take steps which will protect them from falling prey to the unscrupulous who seek to take advantage of our senior citizens,” added Lucy Varpetian, Armenian Bar Association Board Member and Senior Assistant City Attorney for the City of Glendale. Los Angeles Deputy District Attorney and active Armenian Bar member, Amy Ashvanian, who has successfully prosecuted numerous defendants accused of elder abuse, was the keynote speaker for the events. The first lecture took place on January 17, 2018, at the Adult Recreation Center in downtown Glendale and was presented in Armenian. This was followed on February 8, 2018, by a second well-received presentation by Ms. Ashvanian, this time in English, at Glendale’s historic Sparr Heights Recreation Center, on February 8, 2018. The Armenian Bar Association’s Know Your Rights pro bono lecture series will continue with the next topic which is in the realm of housing. The featured keynote speaker is noted landlord-tenant attorney, Raymond Hovsepian. “There is a serious housing crisis in Los Angeles and it is imperative that tenants are aware of their legal rights and take the steps needed to prevent those rights from falling into jeopardy,” said Mr. Hovsepian. The Armenian-language program will be presented on March 22, 2018, at 10:30 a.m. at the Adult Recreation Center and the English-language program will be held on April 12, 2018, at 10:30 a.m. at the Sparr Heights Recreation Center. On February 2, 2018, thanks to the phenomenal work of NALSA board member and President of the Southwestern University Armenian Law Students Association, Brigitte Malatjalian, and talented Armenian Bar members, Alexandra Kazarian and Vicky Ourfalian, the Armenian Bar held one of its most successful pro bono clinics in recent history. In a few short weeks, Ms. Malatjalian assembled a top-notch team comprised of 11 of her fellow Southwestern law students (not all Armenian by the way) who then split into sub-groups of working volunteer units, supervised by criminal defense attorneys Alexandra Kazarian, Vicky Ourfalian, and their attorney colleagues Matthew Kay and Jessica Melikian. Approximately 20 diverse members of the community benefitted from professional assistance with their petitions to expunge criminal records of low-level misdemeanor charges. In so doing, many were given a fresh start on life, allowing them the experience the upside of facing fewer obstacles in securing employment and housing. The event was so successful that the initial date’s calendar completely filled up and there were enough requests for appointments for help that could fill an additional day. “I am so proud of our volunteer attorneys, Vicky Ourfalian, Alexandra Kazarian, Matthew Kay and Jessica Melikian, along with our law students, led by Brigitte Malatjalian. They, essentially, created a fully-operational law office that greeted participants, had them sign a limited-scope service agreement, prepare a complete package for the participants on laptop computers and had the packages printed on a printer generously provided by Southwestern Law School. This coordination meant that all that the public participant had to do is sign, file and serve the documents,” said Chairman Saro Kerkonian. Bagdasaryan, Nina Minassian, Matilda Barseghian, Michael Guloyan, Chizitere Nhadi, Brianna Abrego, Syrita Morgan, Tish Pickett, Sarkis Manukyan, and Marissa Fernandez. In addition, on January 29. 2018, Armenian Bar board members Armen K. Hovannisian and Saro Kerkonian were received by the Board of Directors of the Armenian Relief Society-Western U.S.A. at their headquarters to assess how the two groups may collaborate to meet the ever-expanding needs for pro bono services. Of particular importance is the burgeoning problem of domestic violence in the Armenian community which has drawn increasing public attention as a result of the strength and courage of the victims to come forward and ask for help. Both long-term and immediate potential projects were discussed by the Armenian Bar’s and the A.R.S.’s leadership groups, with a resulting commitment to consider the formalization of volunteer alliances.